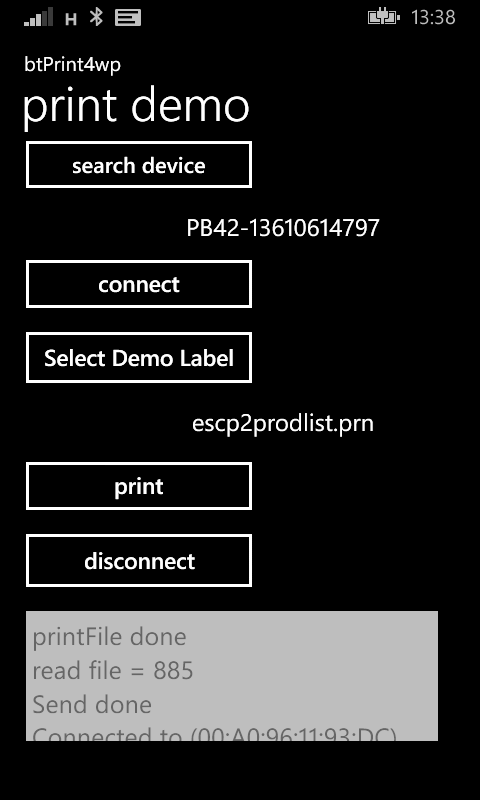 Similar to my BTprint4/Android you will get a list of connected printers and a list of demo files. 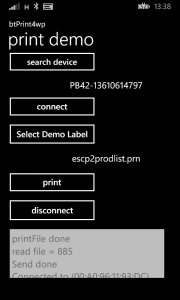 The demo files are the same as for BTprint4. 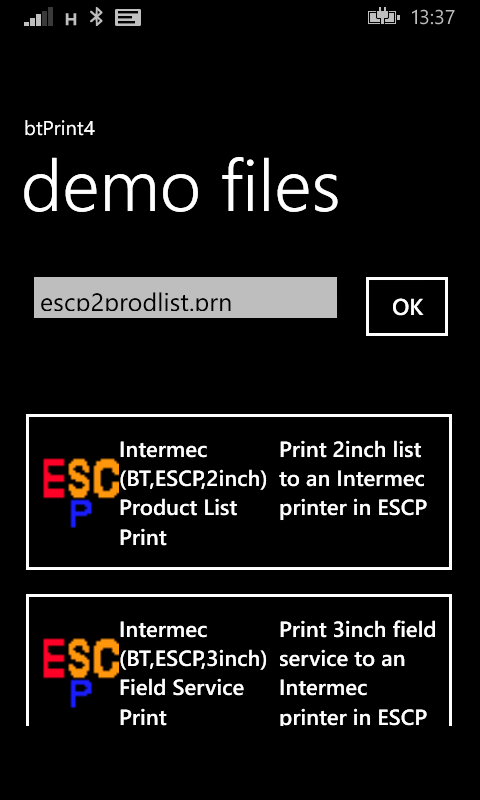 There are files for printers ‘specking’ CSim, ESC/P, IPL (Intermec), Fingerprint (Intermec) and XSim. The files are described in an xml file which delivers some description and help text for the files. Coding was harder than for Android, I missing some API functions to access bluetooth devices. 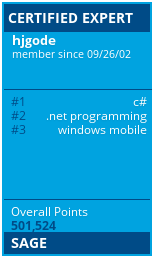 But coding was also similar, with layout files (WPF XAML) and code files. Async/await was also new for me and costs me some time to code. There is no sync access to files and resources, only async functions. The layout designer of Visual Studio Express 2013 offers less layout options with the Phone 8 SDK than Android Dev Studio and the Android SDK. I am missing the FillParent etc. attributes to get a full dynamic layout. Something for future Phone SDKs? As the visual designer was not helpfull in some cases, I had to code the layout by hand editing the xaml file directly. As I use a dynamic created data source for the demo file list, the layout designer only shows an empty ListBox. I created another dummy page (dialog) to be able to get a bit visual design feedback. I found a post about a custom listbox entry and altered that to use a Grid layout instead of the ugly StackPanel. The button is filled with an image and the description and help text of a demo file. This data is taken of the xml file using a class to deserialize the xml. So I get a list of xml file objects with description and help text. As I first used a simple file list and then the xml based file list, I decided to write some Interfaces and classes to be able to either use the file based or xml based approach. So you will find an interface definition for demofile and another for demofiles and then classes implementing these interfaces called demofile. The other class creates DemoFile objects by parsing the xml data. We need to read the xml file and provide the content as string to the de-serialize method. My install did not offer System.IO.FileIO and so I used a byte buffer to read the file and converted that to a string. You can use both classes interchangeable. /// Connect to the given host device. 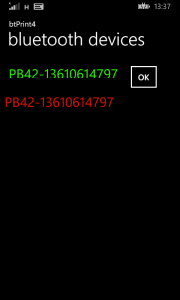 The above code is based on code found at Nokia forum. Hope you find the one or other useful. First of all thanks for your code. 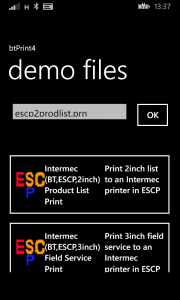 I installed this application from the Store and works perfectly fine with my Intermec PB 32 printer. However, when I deploy the same code to my device from Visual Studio I am able to search for the device but I get an error when I click on the “Connect” button. It throws Generic Exception -2146233088. Any clues please ? I have posted the same question on Code Project as well. I am sorry, but I can not help with VS issues.